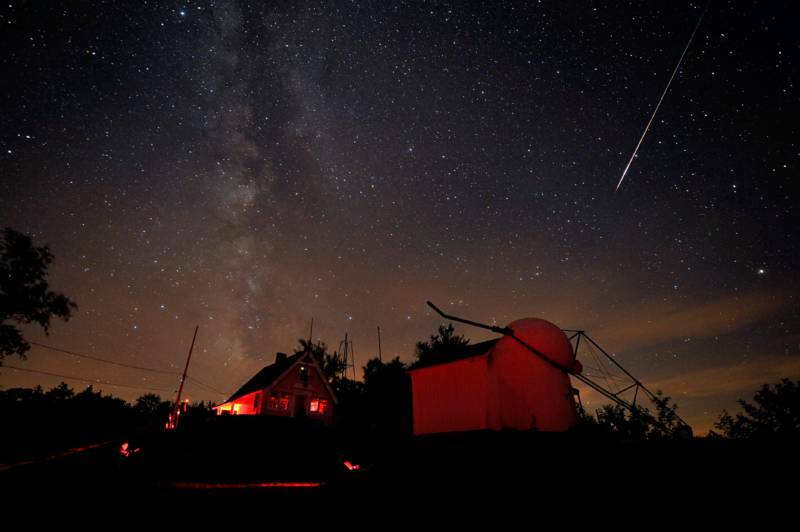 The Perseid meteor shower is back. And this year, scientists say we will see more shooting stars than usual. When the annual meteor shower streaks across the night sky late Thursday and early Friday morning, we could see up to 200 flashes an hour. Normally we would see between 60 and 80. This means the display could be 2016's biggest meteor shower. That's thanks to Jupiter's gravity, which has moved a clump of comet debris closer to Earth's path through space. The flashes of light are a comet's dust particles that burn up after entering Earth’s atmosphere. Astronomers lovingly refer to the particles as "comet garbage." If you're a night owl, you could be rewarded with a spectacular light-show. But as sky-gazers discover each year, the Bay Area's light pollution, combined with Karl the Fog, can make the celestial silt harder to see. San Francisco and Oakland are expected to be cloudy overnight on Thursday but San Jose is predicted to have clear skies. Astronomers recommend getting away from city lights -- especially street lights -- and finding a place that's as dark as possible and ensuring you can see the entire night sky. Some promising spots include Mt. Tamapais, Lick Observatory in San Jose, The Santa Cruz Mountain foothills (including along Skyline Boulevard), and the Altamont Pass in Livermore. You might need to climb Mount Tam or trek up Twin Peaks, however. A dark backyard with a good view may do. The best time to view the shower is after 1:09 a.m., when the waxing young moon sets. After 11 p.m. also works if you can get into a “moon shadow” -- a place where something blocks your view of the moon. "Have the moon be blocked by a tree or a chubby neighbor," advises Foothill College astronomy professor Andrew Fraknoi. Once the moon is out of view, give your eyes 10 to 15 minutes to adjust. Looking directly up is fine, but views to the northeast, toward the Perseus constellation, should proffer the most meteors. 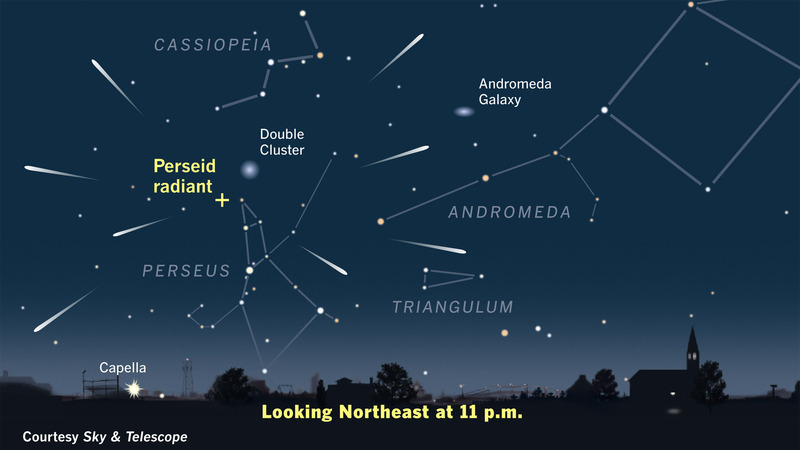 The Perseids are named after this cluster of galaxies because the meteors appear to originate at this spot, which will appear on the horizon at about 10 p.m. local time. The flashes of light you'll be looking for are dust particles from the Swift-Tuttle comet. 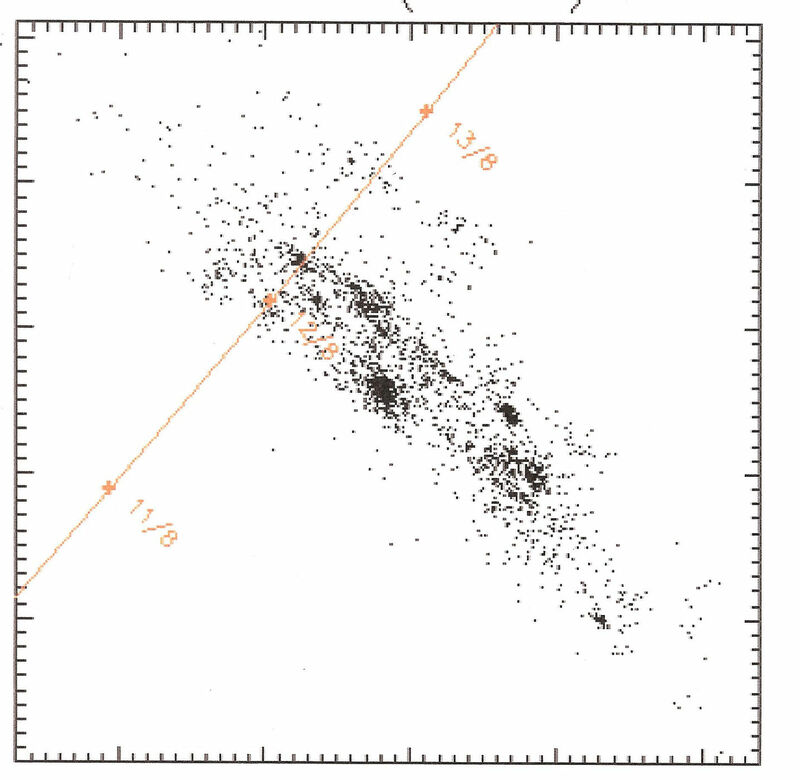 Swift-Tuttle orbits the sun every 133 years and leaves an enormous trail in its wake. The Earth passes through this debris field once a year as it completes its rotation around the sun. “Debris has become strewn all along the comet's orbit. It's like the Charlie Brown character Pig-Pen -- its not just that he’s dirty, but everywhere he’s been is dirty," says Fraknoi. Hence the term "cosmic garbage," made up of sand-size dust particles. And because comets contain carbon, sand, ice and amino acids from when our solar system formed 4.6 billion years ago, this trail has “primeval material from which our entire solar system is put together," says Fraknoi. The meteors slam into the Earth's atmosphere at 132,000 miles per hour. So the white-hot streaks of superheated air are only visible for a fraction of a second to a few seconds. "Some of these are big fireballs, some are small ones," says UC Davis astrophysicist Patricia Boeshaar. "They all have their own characteristics,"
"This is one of the better meteor showers because it's summer, the weather is nice, and they’re usually nice streaks, whereas with other meteors showers you just get little ones," says Boeshaar. If you're planning to stay awake and watch the meteors, make sure you bundle up. If you'd rather stay indoors, NASA will also live stream the event here.